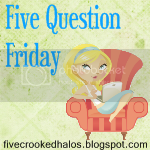 Little Mrs. Married: Five Q's for you! 1.What is the weather like where you are & do you like it? Cozy blankets & cozy pajamas. And a hubby who doesn't mind waiting on me. Ha! 3. What do you need to do by the end of the month? No, but I want to. Yes! I do! Everyone complains about getting called & I don't think I'd mind. I know it's a "hurry up & wait" kinda thing, and i probably wouldn't get picked to be on some major trial, but I still don't think it'd be SO terrible. I think I would find it very interesting. The only thing I would REALLY hate is if it ruined some plans of mine! 5. If you could be any animal, what would you be & why?